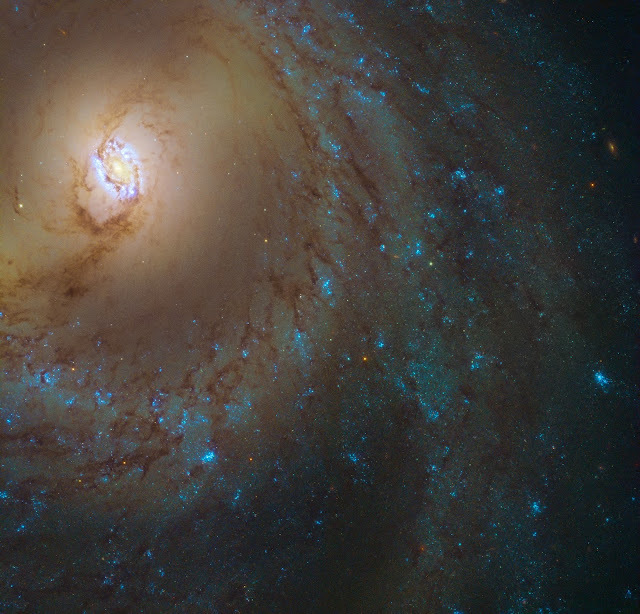 This image from the NASA/ESA Hubble Space Telescope reveals a spiral galaxy named Messier 95 (also known as M95 or NGC 3351). Located about 35 million light-years away in the constellation of Leo (The Lion), this swirling spiral was discovered by astronomer Pierre Méchain in 1781, and cataloged by French astronomer Charles Messier just four days later. Messier was primarily a comet hunter, and was often left frustrated by objects in the sky that resembled comets but turned out not to be. To help other astronomers avoid confusing these objects in the future, he created his famous catalog of Messier objects. Most definitely not a comet, Messier 95 is actually a barred spiral galaxy. The galaxy has a bar cutting through its center, surrounded by an inner ring currently forming new stars. Also our own Milky Way is a barred spiral. As well as hosting this stellar nursery, Messier 95 is a known host of the dramatic and explosive final stages in the lives of massive stars: supernovae. In March 2016 a spectacular supernova named SN 2012aw was observed in the outer regions of one of Messier 95’s spiral arms. Once the light from the supernova had faded, astronomers were able to compare observations of the region before and after the explosion to find out which star had “disappeared”— the progenitor star. In this case, the star was an especially huge red supergiant up to 26 times more massive than the Sun.